A bucket is a common excavator attachment. Buckets, however, have a weight limit. Scooping up more debris than the bucket can handle can place undue stress on the excavator. This is also a dangerous practice. Be mindful of the excavator bucket capacity's limits. Whether you own or rent the bucket attachment, know its weight limit before use. Exceeding weight limits increases the risk that the excavator will tip over. This can cause serious injury to the operator and surrounding crew. At the least, it can temporarily render the excavator inoperable, leading to increased downtime. In addition, you need to know the excavator bucket's weight limit at different points of the boom's working range. The bucket's manufacturer should have a lift chart that you can look up in a manual or online. The manual may come with illustrations depicting weight limits at different points in the lifting arc. The weight capacity also changes when swinging the cab. Larger excavators have greater capacity in this regard due to the counterweight in the cab's rear. Regardless of type of attachment, always inspect for hazards within the vicinity of the lift zone. Be on the lookout for nearby utilities or other overhead obstacles. 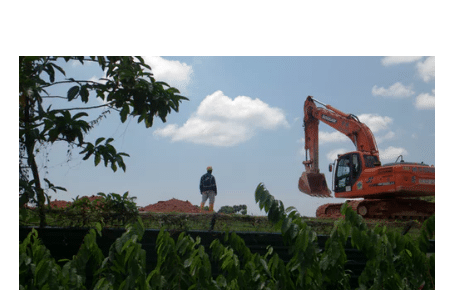 Be certain the excavator is on a stable flat surface as far away from the edge of the excavation as possible. Soft flooring can cause wobbling. This increases the likelihood that the excavator will tip over if the bucket is over or near-over lifting capacity. Be aware of attachment limitations; this goes for buckets as well as breakers and hoe packs. Learn about us and the type of excavators we have on inventory. Drop by Active Excavator Rentals before your next project. Remember to always exercise excavator bucket capacity awareness.